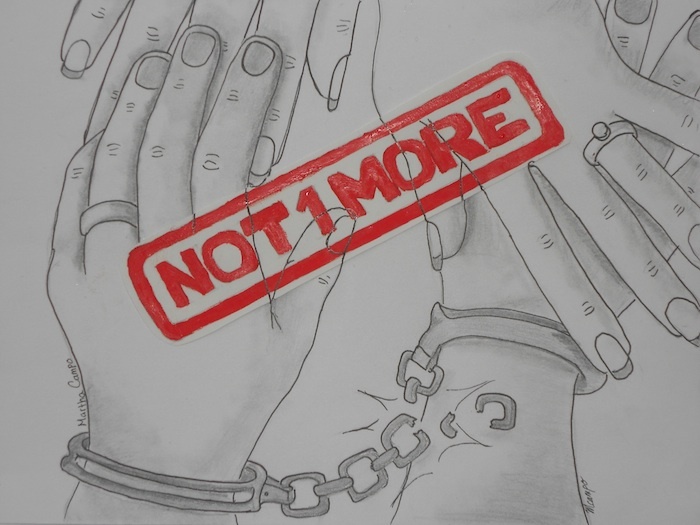 Description: In this drawing you can see how this couples are being separated due to a deportation. Their hope is that this mass deportation can stop and break the chains of those that have been incarcerated so they can reunite with their loved ones. Artist Bio: My name is Martha Campo, I am from Colombia and was brought here at the age of 6. After my visa expired I lived here in the fear that someday I would be deported and separated from my family. While living in the shadows I managed to obtain my high school and B.A. degree. After 20 years of being undocumented I was eligible for Deferred Action. Although having Deferred Action is one of the greatest things I have gotten is still not enough. I have family and friends that live in fear of a deportation. That why I have joined the cause with my art because time to stop all this injustice and move forward with an immigration reform that does not exclude anyone.